Entertaining for a dinner can be tricky business. 1) make a great meal. 2) be an excellent, social host or hostess to your guests- don’t spend too much time in the kitchen. 3) limit your cleanup so that everyone doesn’t spend the evening doing dishes. 4) make it all look effortless. It can be nerve-racking for even a seasoned chef, but I want to encourage every one of my readers to try! One of the main ingredients to achieving the elements of a successful dinner party is choosing the appropriate meal. You don’t want dishes that need to be made at the last minute. Unless you are going for Iron Chef status, you don’t want to plate dishes individually. The first step is a nicely served buffet with flavorful dishes that can mostly be made ahead of time. These tacos are a great starter for your entertaining desires. Chipotle peppers in adobo are smoked jalapeno peppers. They are spicy but also full of flavor. They are a key element to many Mexican dishes and one of my favorite ingredients. To balance out the heat, I decided to mix the peppers with mole-like ingredients. Mole is a traditional Mexican sauce that contains over 20 ingredients and is incredibly difficult to make. I’ll tackle that mountain another week. But for this week, I have used cocoa powder, brown sugar, garlic, and cumin to encompass the flavors of a mole and balance out the spicy chipotles. 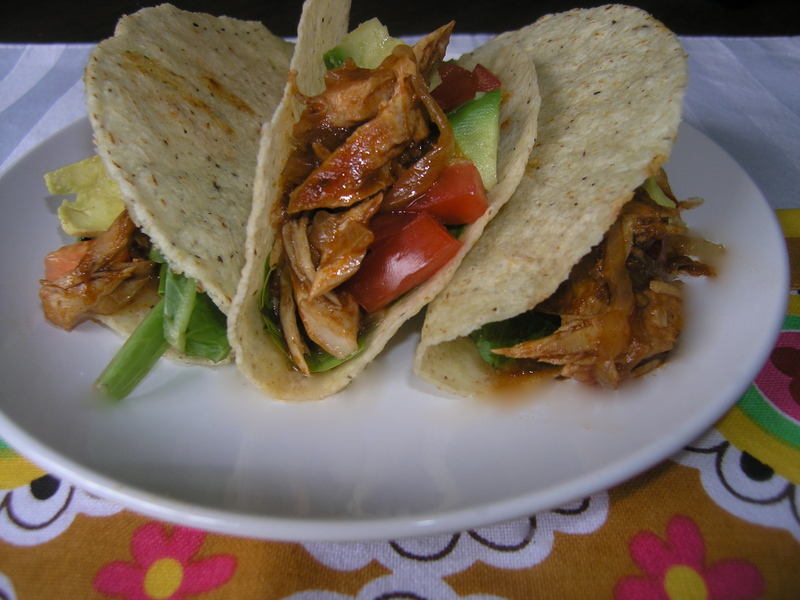 Make the chicken the morning of the dinner and and have all of your taco toppings chilling in the refrigerator. Your guests will be blown away by great flavor while you can sit back, relax, and enjoy your party. In a small bowl combine the cocoa powder, brown sugar, cumin, garlic cloves, and the liquid from the chipotle peppers. Finely chop the peppers, add, and stir to combine. Spray a 9 x 13 inch baking dish lightly with cooking spray. Put the sliced onions on the bottom of the dish. Lightly season the chicken breasts with salt and pepper and place them on top of the onions. Layer the sauce over the chicken. Cover with aluminum foil and bake for 40 minutes. Remove the chicken from the oven and take away the foil. The onions should have broken down and the chicken should be tender and cooked fully through. Use two forks to “pull” the chicken into bite-sized shredded pieces. Continue to mix the chicken with the sauce as you do this, as it will soak it in and keep it moist. Cover with foil to keep warm before serving. Assemble a taco bar by putting all of your toppings of choice in individual bowls. You can do this ahead of time and keep in the refrigerator until ready to serve. Serve the chicken hot and the toppings slightly cooler than room temperature.